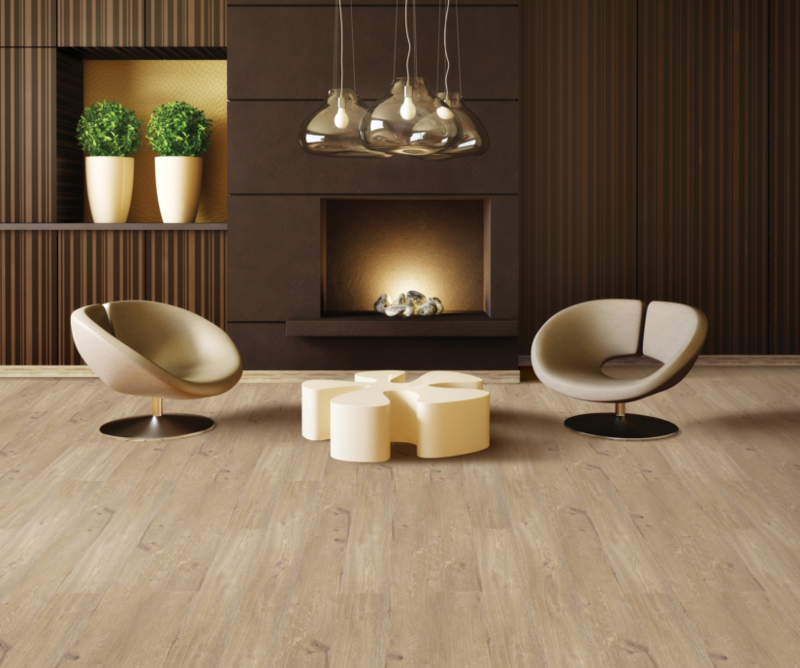 Luxury Vinyl Tiles (LVTs) combine the high-end look of hardwood (or stone) with durability. Van Dyck Floors, the exclusive distributor of Rococo and Verve, has seen a rise in popularity in these two products, and for good reason. Here is an overview of what designers and specifiers need to know about these flooring ranges. Rococo is one of the most luxurious stick-down LVT’s on the market. The name comes from the elaborately ornamental late baroque style of decoration prevalent in 18th-century in continental Europe, with asymmetrical patterns involving motifs and scrollwork. It has been in the market for around five years and continues to delight clients. The planks have bevelled edges and a UV coating with Aluminium Oxide (AO9) for added protection against scratches and surface abrasion. On the official Measurement of Hardness Scale, A09 registers just below diamonds. This coating helps to maintain the appearance of the LVT and results in low maintenance requirements and costs, as well as less downtime for cleaning in commercial environments. The product is suitable for commercial and heavy residential applications and it is very easy to install. It is available in four different size formats: Rococo Classic 184.15mm wide by 1219.2mm long, Rococo Wide Plank 228.6mm wide by 1219.2mm long, Rococo Parquet 101.4mm wide by 304.8mm long and Rococo Xtra 228.6mm wide by 1 524mm long. If you are looking for a product that offers the strength of a wood laminate floor with the flexibility of an LVT, look no further than Verve Rigid Click LVT. It is waterproof, does not require expansion gaps, is very quick to install and has a dimensional stability that is much higher than international requirements. It also offers low maintenance, no telegraphing, no need for acclimatisation prior to installation, and no need for unsightly transition strips in doorways between rooms. It resists smaller subfloor imperfections as well as indentation. In most instances, self-levelling screeds aren’t needed, but it is still important to do the necessary substrate inspections and subfloor preparations if necessary. The tiles can be fitted over most existing screeds and ceramic tile. There are no harmful plasticisers, phthalates or heavy metals. Verve is stocked in five colours, which have been specifically chosen to imitate and highlight the texture and shade differences present in natural timber. It is available in a broader and longer format of 228.6mm wide x 1524mm long and in an overall thickness of 4.2mm with a 0.3mm wear layer making it suitable for light to medium commercial applications. Whether you are interested in stick-down or rigid click LVTs, Van Dyck covers all the various needs of the residential and commercial market in terms of colour and style, installation method and application. For more information, contact Van Dyck Floors on +27(31) 913 3800 or via www.vandyckfloors.co.za.